Good news that DOC will be funded an extra $20.7 million this year to battle the predator boom that is expected this Autumn in response to a massive forest seeding. DOC will now be able to control predators over 800,000 ha, just over 10% of public conservation land. 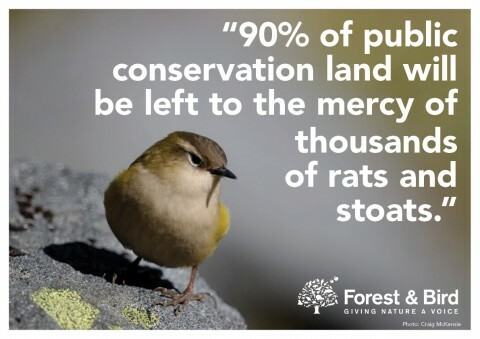 Wildlife over 90% of public conservation land will be left to the mercy of thousands of rats and stoats. Saving wildlife from extinction and building healthy populations of our threatened wildlife including kiwis, rock wrens, bats, parakeets, snails, kaka, kea, and blue duck requires more and consistent funding, not just adhoc responses to forest masts. We know that the birds and bats bred exceptionally well in response to the large scale 1080 drops during the 2014/15 Battle for the Birds. Mohua nesting success in the Dart Forest (in the South Island near Queenstown) went from around 50-90% in response to the 1080 drops. Kaka, bats and morepork were monitored through the 2014/15 drops and none were found to have died from 1080. Rock wren may have succumbed to some 1080 baits, during a snow storm, but their nesting success was 80% in the area treated, compared to 20% in the non treated area. Rock wren are vulnerable to both stoats and rats, and in Fiordland they are being lost from whole valleys.